On March 20, 2016, Curtis had just got off work and was walking to his car. Right after he got into the car and closed his door, he was immediately rear-ended. The collision was so bad that Curtis passed out and didn’t wake up until he was in the ambulance! The other driver claimed to have mistaken the parked vehicle for a moving vehicle and struck it from behind. Curtis sustained a tear in his right shoulder and back injury that later required surgery. He suffered multiple bulging discs and also underwent surgery to the middle finger on his right hand (7 stitches). As a result of his injuries, Curtis was confined to his bed for four months and couldn’t work for at least eight months. It is likely that he will have to undergo further pain management and surgical intervention to his spine. Initially, Curtis was at another firm for about 5-6 months and did not have a good experience in his opinion. That firm struggled to make any progress on his case so he decided to reach out to The Case Handler team. “The Case Handler team did a way better job,” said Curtis. Adam Handler – The Case Handler fought hard to obtain the compensation that Curtis deserved. After meticulous investigation, The Case Handler team realized that the other driver was actually working AND driving a rental vehicle. As a result, our team was able to increase the settlement amount since we were able to recover funds from TWO insurance companies! 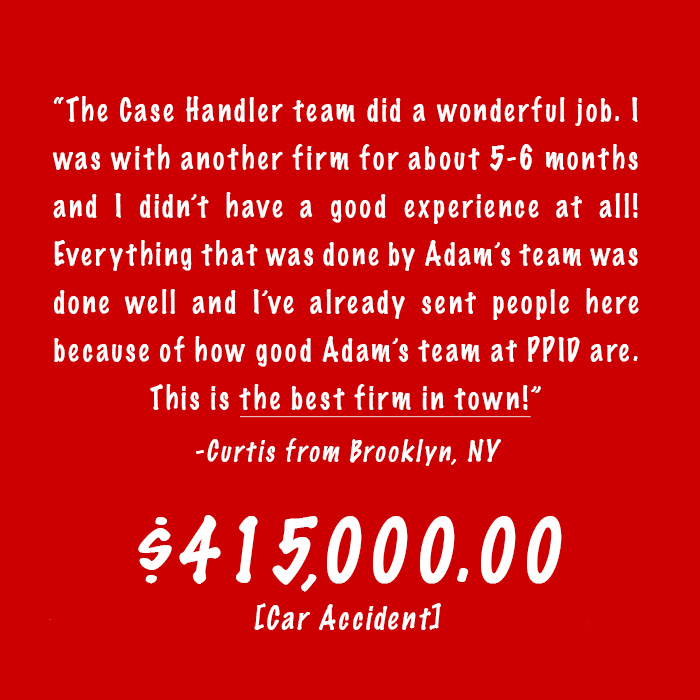 Curtis, with the help of our experienced personal injury team at PPID, was awarded a total of $415,000.00 for his bodily injury claim! Sometimes, the best of drivers cannot avoid an accident. Being rear-ended by someone else is a terrorizing situation to experience. Getting past such a terrible situation may seem unmanageable, but that’s when you want an experienced team like The Case Handler team by your side to handle it for you. With only one chance to get compensation in a personal injury claim, consider talking to a highly regarded law firm that’s known for being, “the best firm in town.” If you or a loved one is involved in a rear-end accident, make sure you reach out to our reputable team for guidance.